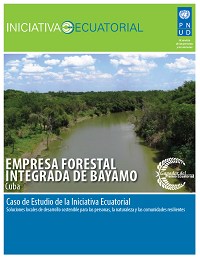 The Empresa Forestal Integrada de Bayamo (Integrated Forestry Enterprise of Bayamo) is a state-run forest enterprise operating in the Cuban province of Granma. In 1999, Granma was one of two pilot sites for the ecological forest farms (Fincas Forestales Ecológicas) initiative, which put reforestation of Cuba's Cauto River basin in the hands of smallholder farmers. The working model saw land divided into plots and assigned to interested households for a concession period of 30 years. These farming households were given responsibility for managing and reforesting plots of between 12 and 25 hectares in size, and were encouraged to plant timber-yielding trees, fruit trees and medicinal plants, and raise livestock on their plots. The initiative had expanded to three hydrological regions of the country by 2004; the result was the reforestation of over 3,000 hectares of land along the banks of the Cauto River, and improvements in livelihoods and wellbeing for economically marginalized communities.